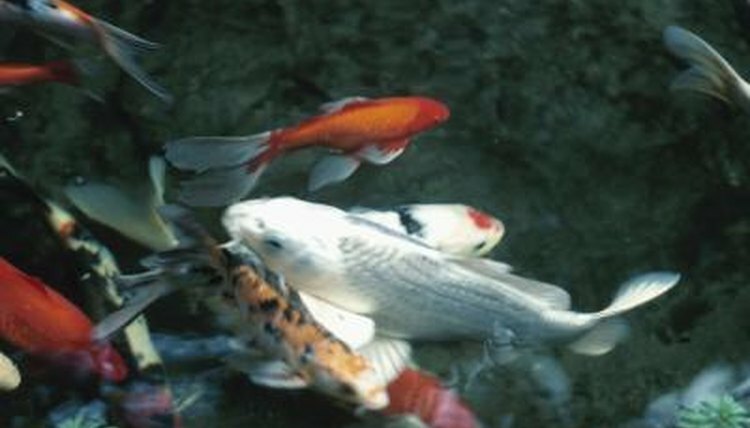 Popeye can affect koi and other fish who live in less-than-ideal conditions. Overstocking and poor maintenance can promote the conditions in which opportunistic diseases like popeye can thrive. With popeye you need to both address the underlying water quality issue and treat the infection itself. This prevents recurrence and additional health issues for your koi. A variety of common organisms can cause popeye, including a number of bacteria. These organisms usually live in aquarium water but cause illness only if something weakens your koi, like poor water quality. This make popeye an opportunistic infection, a disease that can occur only when something else harms the fish. In popeye, the infection causes fluid to build up behind the eye, causing it to distend. Usually, popeye does not kill a fish; a koi can make a complete recovery from it. However, the conditions that promote popeye usually favor other more dangerous infections. In smaller fish, topical aquarium antibiotics may help. Pet shops sell such antibiotics; look at labels to find one that can treat popeye when dissolved in the water. Since koi grow larger than most ornament fish, they may need medication to treat the infection from the inside -- particularly with larger koi. You can procure medicated food from a veterinarian, who can explain proper dosage. Keep in mind that treating the infection will not necessarily treat the underlying water issues, which can foster recurrence. Popeye rarely happens under ideal water conditions. Testing for ammonia and nitrite can indicate issues with the pond's water. Ammonia levels above 0 ppm and nitrite levels above 20 mg/l indicate a problem. High levels of these nitrogen compounds stress koi, leaving them more vulnerable to opportunistic infections like popeye. Poor maintenance, like skipping water changes or failing to replace filter media, can contribute to these conditions. Overstocking a pond also often causes elevated levels of ammonia and nitrite. Avoid adverse water conditions by carefully observing stocking levels. Different experts have different stocking levels, based on either water volume or surface area. One easy guideline holds that you need 300 square feet of pond surface area per koi. Keep in mind that a properly stocked pond has a lower chance of its inhabitants contracting popeye and a reduced risk of unsightly algae blooms. How Do Goldfish Get Fungus on Them and Is It Harmful? What Is Columnaris in Goldfish? What Do You Do if Your Goldfish Is Unwell? What Happens When Your Fish Gets Dropsy?